We at KBR are lucky lucky people. We get to see literally dozens and dozens of books per month for review - and it's a joy to immerse ourselves in such literary wonder, from picture books to young adult fiction. Because we amass so many brand new, beautiful books, we eventually end up with a very tall mountain of fabulous stories - and no one to read them. Books need to be read. Do you have children who need books to read? We have two sets of brand new, beautiful, current books to give away but it's very important to us that these books go to children who really need them. We are therefore calling for NOMINATIONS. Do you know of a school, childcare centre or child-focused organisation in the Canberra region that could use these books? The lots feature a variety of amazing, current, brand new books, including full chapter book series - and each set is valued at over $1000. The sets cannot be split or picked over - they come as is, and are of the highest-quality, from both major and indie publishers. Each set will go to a different recipient. Because these books are majorly heavy, this giveaway is only open to those in the immediate Canberra area (within a 50km radius of its borders). We are happy to open it to those outside the Canberra, but the recipient will need to organise collection of the books within one week's notice, no exception. Please write up your nomination - using no more than 500 words, telling us why your nominee deserves these books, and which book set they would benefit from - younger or older children. Yes, you can self-nominate. Yes, you can ask your friends and colleagues to nominate you, as well. Multiple nominations (not from the same person) are warmly accepted. The nomination must include the full name, address and contact details of the school, centre or organisation you are nominating. It must also include the full name, address and contact details of the nominating person. Please also advise if you are willing to have your name revealed to the winning nominees. Remember, the nominee should ideally be located within the Canberra region. If they are over 50km outside the ACT border, you will need to ensure the books can be collected either by the recipient or someone else locally, within one week's notice. Send your nomination to taniaATkids-bookreviewDOTcom. Nominations are NOW OPEN and close 5pm 30 November. The recipients will be notified by email on 30 November, and announced on the KBR website on 1 December 2011. Recipients will be published on the website, unless recipients specify otherwise. 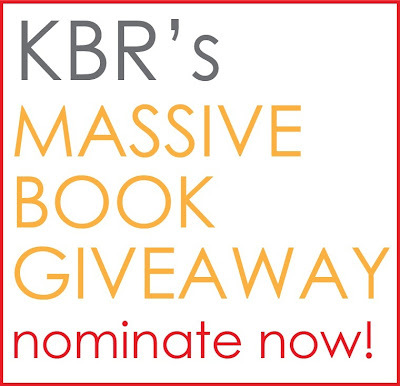 The nominations will be judged by the KBR team, and no correspondence will be entered into. Let's get these amazing books to someone who needs them. Nominate now! Will get on to this. Love this idea Tania!